-S.H.I.E.L.D (Wild) substitutes for all symbols except scatter . -Only Highest Win Pays Per Line. -Win combinations pay Left to Right only except scattered Idols, which pay any. -Game is played with 20 Lines only. -Malfunctions void all plays and pays. -3 scatter or more anywhere in main game, 20（A）appear on the screen , pick an icon to reveal an Avenger. 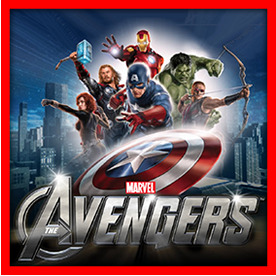 Match 3 of the same Avenger:Hulk, Ironman, Thor, Or Captain America to start the corresponding free games. After free games mode ends, Wall of Heroes bonus screen will re-appear and reset and additional free games modes can be won. If Loki is revealed, feature ends and main game resumes. -You win 9 free games. -Before each spin , a random multiplier appearing on Captain America's Shield of x2-x5 is determined for the next free spin. -More free games cannot be re-triggered. -After free game mode ends, wall of heroes bonus screen will re-appear and reset and additional free games modes can be won. -Free games begin with x1 multiplier. -Every 3 spins, multiplier goes up +1. -All wins during a spin are multiplied by the multiplier's value during that spin. -Ironman Heart Appears in the middle position of the 3rd reel during all free game. -Ironman Heart is extra wild, substituting for all symbols except scatter. -More free game cannot be re-triggered. -Lightning shoots from Thor's Hammer, randomly distributing 0-5 Thor's Hammer on the reels. -Thor's Hammer is extra wild and substitutes for all except scattered Idols Wilds from reels can be hit by the lightning. -Scatters pay before they are hit by lightning. -The Hulk is stacked wild on reel 3 in free games and substitutes for all symbols except scattered Idols more free game cannot be re-triggered. -Captain America, IronMan, Thor, Hulk and Nickfury in any order appearing consecutively on an active payline and starting with the leftmost reel, will award 200x line bet. -S.H.I.E.L.D (Wild) does not participate in avengers assemble feature. -Feature is available during main game only.